Origin: Native to tropical and temperate Asia and the Pacific Islands. 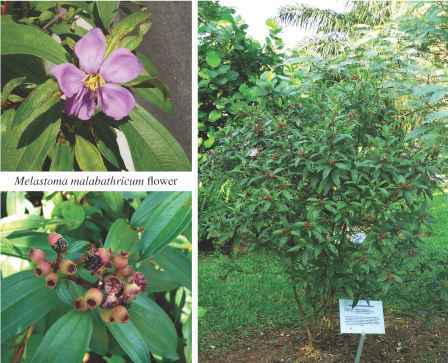 Traditional Medicinal Uses: In Indonesia and Malaysia, the leaves and roots are used as a remedy for diarrhoea and dysentery. 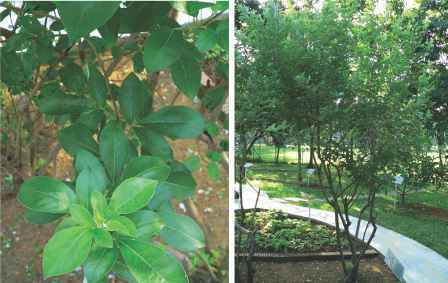 The leaves are also used to wash ulcers, to treat piles and for small pox pustules to prevent development of scars. Its bark is used to treat skin diseases. Pharmacological Activities: Analgesic, Anti-inflammatory, Antineoplastic, Antinociceptive, Antiviral, Antioxidant and Antiplatelet. Dosage: No information as yet. Adverse Reactions: No information as yet. Toxicity: M. malabathricum was reported to be an aluminium (Al) accumulator (with up to 10 g Al/kg of dry weight in old leaves and up to 7 g Al/kg dry weight in new leaves) and could lead to accumulation of aluminium in the bone and brain, leading to neurotoxicity, when consumed in large amount.